Badgelife is the celebration of independent hardware creators, working for months at a time to bring custom electronic badges to conferences around the world. This year at DEF CON, Badgelife is huge. It’s not just because this year was supposed to feature a non-electronic badge, and it’s not because the official badge imploded last month — Badgelife is all about people spending most of the year designing, and manufacturing hardware, culminating in one very special weekend. [Garrett] owns Hacker Warehouse, a store providing all kinds of neat hacker tools ranging from software-defined radios to lock pick sets to side channel analysis toolkits. This year, [Garrett] decided he wanted to branch out his business and get involved in a little bit of hardware creation. He’s been curious about this for some time and figured a limited edition DEF CON badge made sense. What he wound up with is a beautiful little badge with games, blinkies, graphics, and potential to cause a lot of wireless mischief. Would you look at that. RF design on an independent badge. The design of the Hacker Warehouse badge is surprisingly simple compared to the Bender Badges and puzzling crypto badges that are also part of this year’s Badgelife hardware celebration. On board is an ESP8266 with a custom PCB implementation that includes a larger Flash chip. The other side of the board is loaded up with four tact switches in a D-pad arrangement. On top is a 96 x 64 pixel full-color OLED display, and blinkies are provided by fourteen mini WS2812 RGB LEDs. Power is provided by two AA cells and what looks to be a nice fancy switching regulator. This is real hardware, not just a few modules thrown together with a bunch of LEDs. This badge is built around the ESP8266, a very interesting WiFi-enabled microcontroller that has more features than it should. 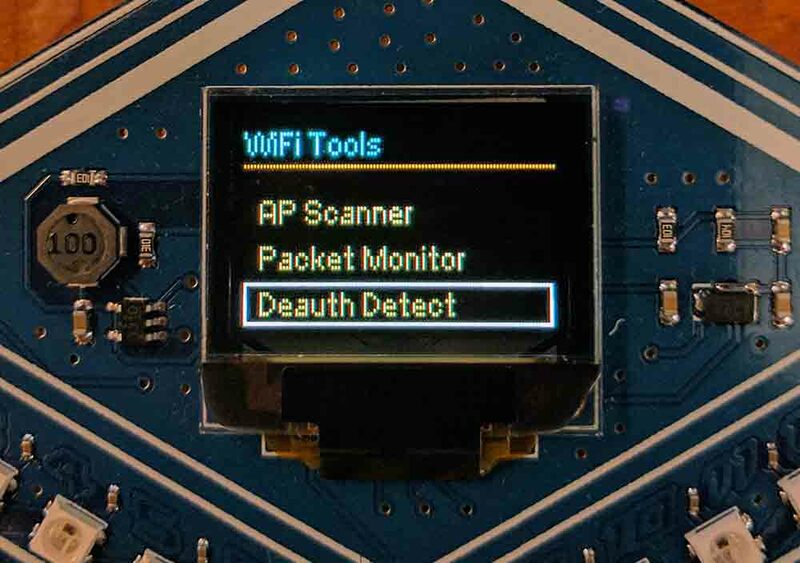 [Garrett] is using the ESP as a WiFi scanner of sorts, allowing anyone with this badge to monitor WiFi channels, APs, packets, and — this is important — deauth packets. Over the last year, there have been a number of projects around the Internet that take an ESP8266 and spew deauthorization frames into the spectrum. These frames cause a WiFi client to stop using an access point, and basically shuts down all the WiFi in an area. It’s well documented, and people have been doing it for years, but the ESP8266 makes deauth attacks so very, very easy. We’re going to see a lot of deauth frames this year at DEF CON, and the Hacker Warehouse badge will be able to detect them. It can also generate these frames, but that capability is locked for now. An electronic conference badge isn’t cool unless it has obnoxiously bright and glowy LEDs, and the Hacker Warehouse badge is very cool. 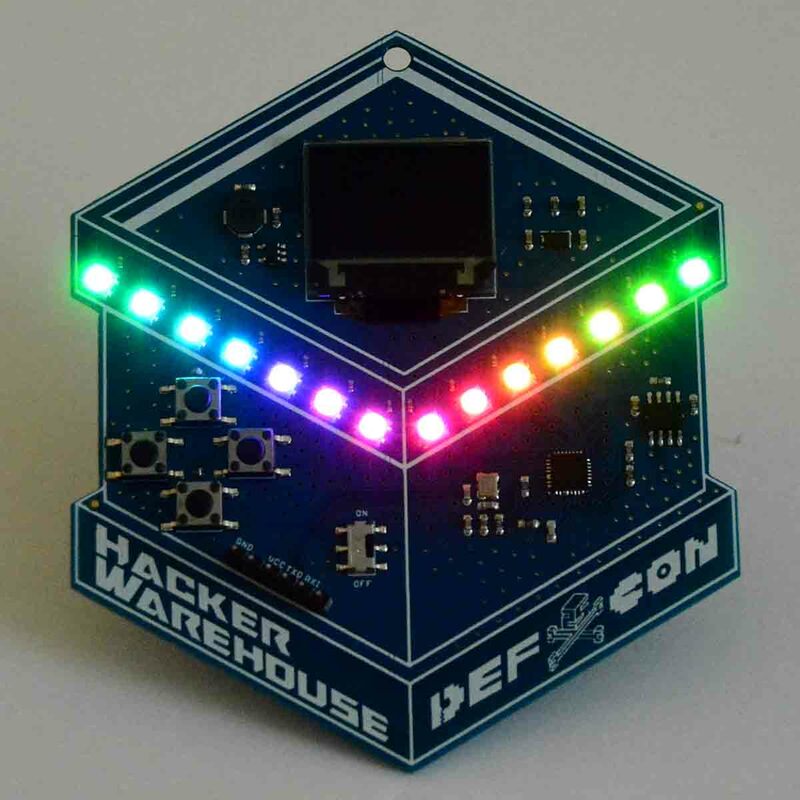 Onboard the Hacker Warehouse badge are 14 RGB LEDs, programmed with 46 different patterns that are certainly bright enough to annoy someone. This is what you need for a badge, and it’s beautiful. This is a truly fantastic badge that’s also a great development board for the ESP8266. Everything you need for portable WiFi gaming fun is already there — you have blinky LEDs, an OLED, what seems to be a fairly nice power supply, and enough buttons to do something interesting. All you need to do to program this badge is attach a USB to serial adapter to the pre-populated header and you really have something. 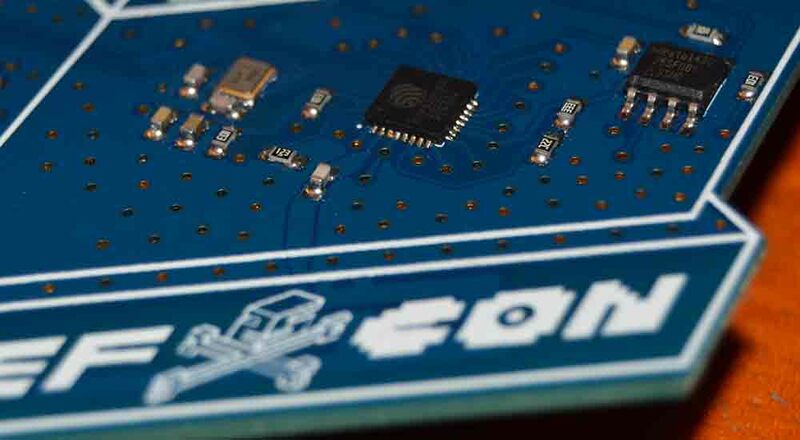 It’s a great badge, and we can’t wait to see the hacks for this great piece of hardware next week at DEF CON. Are they going to put their documentation up on github? The only part that interests me: mini ws2812s exist? At a glance they look like 3535 sizes instead of the more common 5050s? There’s an even smaller 2427 version too. If you are OK with APA102’s there is a 2020 version of those. They are mind blowingly small.